The memories of the soldiers in the World War 1 trenches are a valuable part of history. From Belgium and France to Gallipoli, all the soldiers remembered dealing with a war without end interrupted only too briefly by temporary local Christmas and other ceasefires made by soldiers in the trenches. The early battles beteen British and German armies in 1914 at Mons and Le Cateau in France led to the start of the Battle of the Aisne on September 12. Among the accounts by Captain Ernest W. Hamilton with the British Expeditionary Forces 11th Hussars. "It became apparent to our commanders that the retreat of the Germans had been in accordance with a plan pre-arranged and that the pursued now definitely stood at bay. The situation was not one to encourage a reckless offensive...It was not known at that time, but on the Craonne plateau crowning the slopes opposite, the forethought of the Germans had prepared in advance a complete system of very elaborate trenches of a kind then new to warfare, but since horribly familiar. They were supplemented in many cases by the old stone quaries and caves which run the length of the heights. Such was the scene in which the German and Allied armies were destined to face one another for over a year, dealing out ceaseless death, desolation and pain, and gaining no fraction of military advantage for either side." "On the morning of the 28th, while the 2nd Coldstream were on the left of the 4th Brigade at what was know as Tunnel post, three men of Captain Folluett's company were sent out in a very thick mist to reconnoitre. It was a risky undertaking for the German lines were very close. Suddenly the mist lifted and two of the three were instantly shot, the third getting home with only a graze. As leaving them where they lay meant fourteen hours exposure before they coud be got in under cover of darkness, Pte. Dobson volunteered to try to get them n at once. The undertaking on the face of it an absolute impossibility as it involved crossing a good deal of open ground in full view of the enemy. However, Dobson crawled out and managed to reach the men one of whem he found dead and the other woundeed in three places. He applied first-aid dressing and then crawled back. A few minutes later he crawled out again, this time in company with Corpl. Brown. The two mendragging a stretcher between them on which the wounded man was placed and dragged back to safety, none of these three being hit. It need be scarcely added that Dobson got the Victoria Cross for this most remarkable performance and Corpl. Brown being awarded the D.C.M.7"
by Major Eduard Zimmerle, Wuerttembergische 49th Feld Artillerie Regiment Photo of French trenches captured by the Germans during the attack. "On June 30 at 5:15 AM the bombardment of the French positions began. Our infantry in the front lines had been pulled back and so it was possible to take the enemy under fire without our own infantry being endangered by any shells falling short. At first the Grenadier Regiment No. 123 fired on the positions with a light field howitzer battery, a heavy field howitzer battery and a 21 cm. Morter battery along with a railroad field cannon and light, medium and heavy Minenwerfern. Soon the valley was filled with smoke and the enemy positions could no longer be seen. The French were generally overwhelmed and those not under the rubble retreated or surrendered. From individual dugouts there was resistance. Our munition handlers were shot at from a telephone hut. One Grenadier calmly cleaned it out with a hand grenade and when he was shot at from another dugout he captured the two Frenchmen at the point of his bayonet. The attitude of our men was excellent and the urge to move forwards conquered what we had earlier believed could only be captured piecemeal." Early in the war, there were local unofficial Christmas 1914 truces. 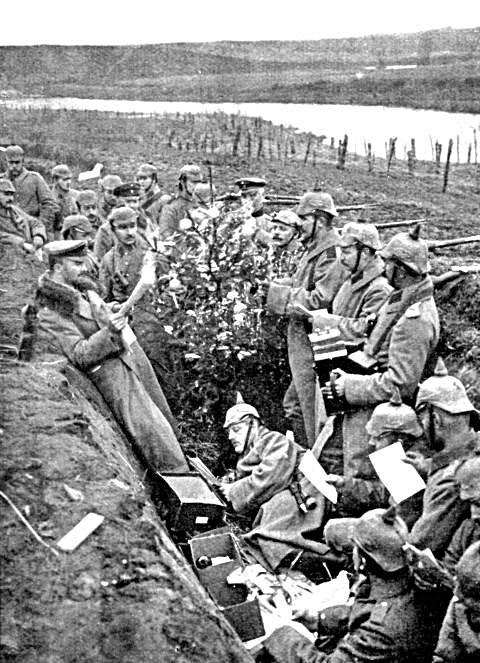 Along some sections of the front line trenches British and German soldiers met openly between the trenches, enjoyed their adversaries Christmas carols and even exchanged gifts. German photo shows one incident in no-mans land between the trenches. Another photo shows British and German soldiers together in a trench. Unfortunately, those incidents were too short. Once discovered by higher ranking officers far behind the front lines, orders were issued to stop the peaceful activities and return to the business of killing the other soldiers in the trenches. And, too often, those orders were very forcibly enforced on their own troops by shelling the enemy trenches and, if necessary, their own trenches. However, there were other truces such as a German - French ceasefire due to flooding. In the background are the French soldiers. "On 16 December, 1916 there was something different to experience. It rains. It rains not a normal rain but it goes on and on. And when the rain momentarily stops we have in between snow. The dirt become bottomless and the trenches become stream beds. By the French it is even worse because their positions are lower. Here stand the men opposite each other during the ceasefire. Men bail water, build drainage ditches and take advantage of the situation." At the oubreak of the war, Britain and France began to plan an invasion of Turkey, which was still neutral, to seize control of Constantinople the capital of Turkey and the Dardanelles Straits between the Medierranean Sea and the Black Sea. The purpose was to be able to ship war supplies to Russia. 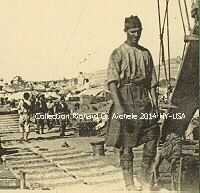 The British and French also planned to seize Gallipoli that is the peninsula on the west side of the Dardanelles Straits. The land invasions began before the final battle for the Dardanelles and continued for several months after. The British land forces were made up primarily of Australian troops. French colonial troops were also involved. Throughout the invasion, the Allied forces were supplied with food, water, ammunition and other supplies carried and hoisted off the British and French supply ships moored as close to shore as possible. Among the support vessels was the Australian submarine AE2. In the hot days, it was tedious, tiring, never ending work as this young soldier's face seems to show. Supported from the sea by British and French warships, "the Australian Division and the newly arrived 42nd Division advanced after a prolonged and terrible bombardment which broke down the Turk defence that their works wfere carried all along the line except iin one place. Our advance varied in depth from a quarter of a mile to six hundred yards all of it carried in a rush, in a short time, though with heavy losses from shrapnel and machine gun fire. In this attack the 42nd or East Lancashire Division received its baptism of fire...In this campaign we were to taste, and be upon the brink of, victory in every battle, yet hae the prize dashed from us, by some failure elsewhere, each time." In the French sector, Haricot, an earthwork fortress, stormed by the French an hour before was garrisoned with Senegalese troops. The Sengalese could not hold it; the French could not support it; and the Turks won it. Unfortunately the Haricot then enfiladed the lines we had won...and the Royal Navy Division was forced to fall back," according to John Masefield in his book Gallipoli. The fighting was brutal for both the Allies and the Turkish forces. 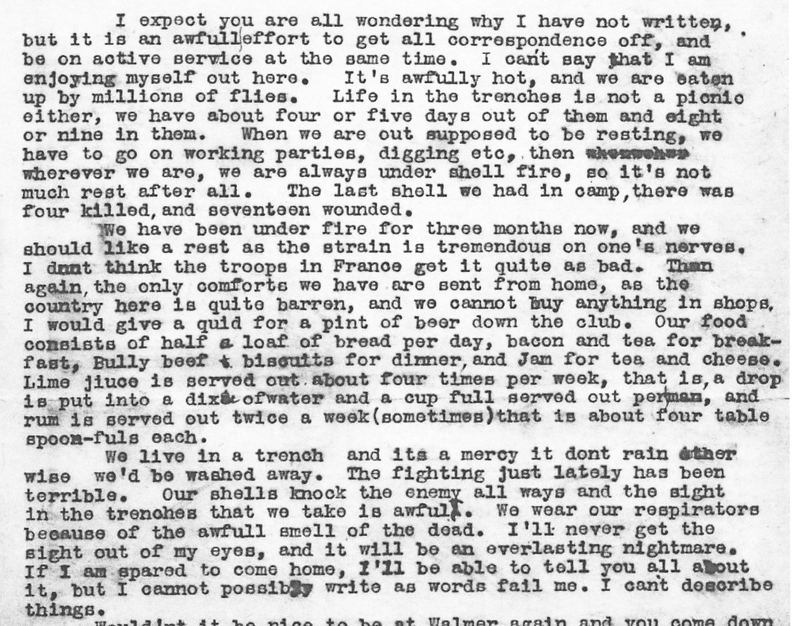 This is part of a letter written in April, 1915 by T. Harold Watts, a soldier with the British Royal Navy Division, describing the daily realities. Masefield wrote: "On August 5th, the Australian brigade told of the planned attack, sharpened bayonets, and prepared their distinguishing marks of white bands for the left arms and white patches for the backs of the right shoulders. In the afternoon of the 6th, the shelling of the ships became more intense; at half past four it quickened to a very heavy fire; at half past five it stopped suddenly. The three whistle blasts sounded and were taken up along the line, our men cleared the parapet in two waves on a front about one hundred and sixty yards "and attacked with vigour." "They had not gone twenty yards before all that dark and blazing hill-top was filled with explosion and flying missiles from every enemy gun. One speaks of a hail of bullets, but no hail is like fire, no hail is a form of death crying alound a note of death, no hail screams as it strikes a stone or stops a strong man in his stride. Across that kind of hail the Australians charged on Lone Pine. It was a grim kind of steeplechase, said one, but we meant to get to Koja Dere." Left Photo: Verdun's Fort Douamont early 1916 before the battle began. Right Photo: Late in 1916 after months of German artillery bombardment. Both photos taken by German aerial reconnaisance aviators. The city of Verdun, Fort Douamont, Fort Vaux and other strong installations were west of the Meuse River. Cote 304 and Le Mort Homme were French defense positions east of the Meuse facing German lines in Montfaucon and Romagne. From the book Poilu based on notebooks of French Army Corporal Louis Barthas translated by Edward M. Strauss, Barthas wrote: "May 17, from noon to 4:00 in the afternoon, the Boches unleashed upon Cote 304 one of the most terrible bombardments that I heard and saw throughout the whole war. A thick cloud of dust, marked with black smudges or by the vivid green left by burtsing flares against the sun's rays, burned our eye and parched our gullets, while the stench of sulfur or of I don't know what, mixed with the smell of rotting flesh, grabbed us by the throat. Like the waves of a raging ocean, the salvoes of iron and fire marched forward, retreated, advanced again, submerging Cote 304 in a torrent of shellfire. And to think that we were only one small link in Verdun's chain of defense. To our right, at Avocourt, and to our left toward Chattancourt, the cannonade went wild. And on the other side of the Meuse, at Damloup, Fleury, the Fort of Vaux, it was even worse." According to a surviving French officer, Lieutenant Foucher: "Setting out from the citadelle of Verdun on June 6, 1916. the 1st Battalion of the 137th reached the line on the night of the 10th - 11th and relieved the 337th. The trench lay on thr right of the 3rd company and on the left of the 4th company. In the morning of June 11th a violent bombardment took place lasting all that day and part of the night. During the course of the 11th, the trench was under bombardment of shells of 150, 210 and other calibers. The men were awaiting the assault with fixed bayonets but their rifles were propped up against the parapet within reach for they had in their hands bombs to be used as the first means of repelling the probable attack. Shells falling in front, behind and on the trench broke the edges of the trench burying our brave Vendeens and Bretons. Owing to the men not having their rifles in their hands, the bayonets stuck out after the collapse of the trenches. From that evening, June 11, 1916, the trench kept the appearance which it still had at the Armistice." The trench survived the war. 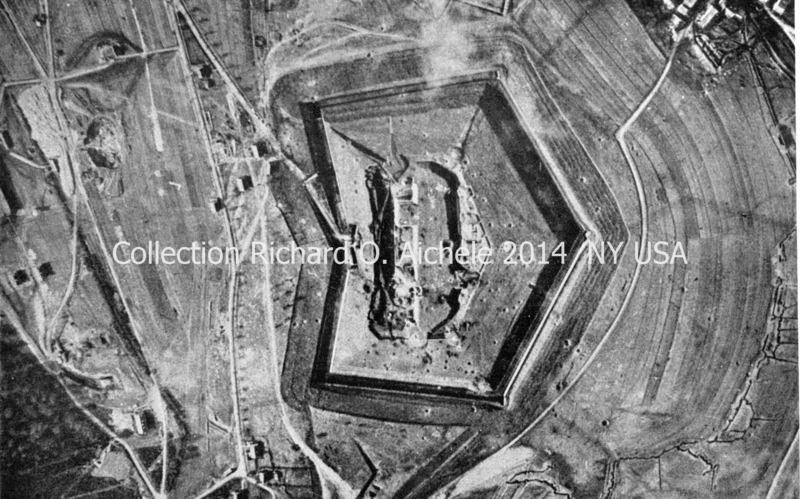 Photo shows it surrounded by a monument built after the war to preserve the trench as it was in 1916. After the artillery duels quieted, the Kanoniers of the Wuerttembergische 49th Feld Artillerie Regiment's Batterie Scheerer began digging out a gun after the firing position was hit by heavy caliber English artillery fire on July 14. Not Shooting Too Briefly - "Frenchmen, Germans, soldiers, all comrades"
During July 1916, one area of the front in the Champagne region was a quiet area for the French 296th Regiment. According to French Army Corporal Louis Barthas, at some points, the French and German trenches were as close as 6 meters apart. A French Lieutenant intent on ending the short time of peace created a disturbance. When a German sentry looked over the top of his trench, that officer shot him in the head. The result was heavy rifle fire between the two sides for a day. .
A day later, Barthas wrote, "As daybreak approached, the Germans called out to us. There were three of them and they asked if we had any coffee to drink. They told us, the day before, our artillery had killed two of their comrades. But I hastened to bring this conversation to an end. We told them about last evening's incident and they should keep from showing themselves as we are being closely watched. The Germans, deeply moved, thanked us profusely before disappearing behind their sandbags. One of them clasped one hand in the other and cried out: 'Frenchmen, Germans, soldiers, all comrades. Officers….' And here he raised one clenched fist shouting ---'No.' . How right he was, this German. It's true you should not generalize. But how many of our officers were distantly separated, more generally estranged from us soldiers than were the poor German devils who were being led into the same slaughterhouse despite themselves. Little by little both sides became more confident in the reciprocal interest of not firing on each other, and they ended up showing themselves without challenge, exchanging a wave of comraderie, a smile, a friendly look. .
"In the early morning of the 1st of July, 1916, our men looked at the German positions as they showed among the bursts of our shells. Those familiar heaps, the lines, were then in a smoke of dust full of flying clods and shards and gleams of fire. Our men felt that now, in a few minutes, they would see the enemy and know what lay beyond his parapets and probe the heart of that mystery. So, for the last half hour, they watched and held themselves ready, while the screaming of the shells grew wilder and the roars of the bursts quickened into a drumming. Then as the time drew near, they looked a last look at that unknown country, now almost blotted in the fog of war, and saw the flash of our shells breaking a little further off as the gunners lifted and knew the moment had come. Then for one wild confused moment they knew that they were running toward that unknown land, which they could still see in the dust ahead. For a moment, they saw the parapet with the wire in front of it, and began, as they ran, to pick a path through that wire. Then, too often, to many of them, the grass that they were crossing flew up in shards and sods and gleams of fire from the enemy shells, and those runners never reached the wire, but saw, perhaps, a flash, and the earth rushing nearer, and the grasses against the sky, and then saw nothing more at all, for ever and for ever and for ever." "In the area of the Command Post North, a wounded English flier made a forced landing. The German flier who shot him down, landed next to him and provided the badly wounded adversary first aid assistance." For the German Army it was "der Arrasschlacht" and For the Australian Army it was the Battle of Bullecourt. The Arras - Bullecourt attack ordered by British Major General W. Holmes began on April 11, 1917 at 4:30 AM against the German Siegfried (Hindenburg) line. In that region it was defended by Wurttembergische Infantry Regiment 120, Infantry Regiment 124 and Grenadier Regiment 123. Major Eduard Zimmerlle's documents show the Wurttembergische Feldartillerie Regiment Nr. 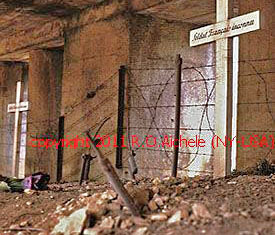 49 batteries in positions at Cagnicourt - Hendecourt supporting the German infantry regiments. The attacking primary forces were the Australian 4th Division's 4th Brigade and 13th Brigade to be supported by British tanks and artillery. The attack had been scheduled for April 10 but the supporting British tanks did not arrive so the attack was postponed until the next day. The next day, April 11, according to www.anzacsinfrance.com: "By the start of the attack only 3 tanks had arrived to assist the Australians. Most supporting tanks failed to appear. When engaged these tanks proved unreliable and too slow so the Australian proceeded without them. The tanks failed to even reach the wire and by 7am they were all burning. With no tanks or artillery the Australians fought their way to occupy sections of the Hindenburg Line, with parts of the Australian 4th Division occupying the Hindenburg Line without artillery assistance. They sent up flares asking for artillery support on Reincourt, 1.5 kilometres from Bullecourt, a position from which they were receiving machine gun and rifle fire. However, the support failed to arrive and the Australian 4th Brigade found themselves cut off by enemy shells, machine guns and counter attacking infantry. Incorrect reports had suggested that the attacks were successful and therefore artillery support was unnecessary. They had no option but to withdraw. On the left flank of the Australian front, closer to Bullecourt, the 12th Brigade of the Australian 4th Division was also intensely engaged. German troops on either side of the Australian 48th Battalion and a portion of the Australian 47th Battalion worked their way behind the Australians. This now meant the Australians were completely surrounded. Under Captain A.E. Leane, the men of the Australian 48th attacked and captured the trench to their rear. Now artillery from the 5th Army began to fall, but it fell on the Australians. Again, there was no option left but to withdraw." Major Zimmerle's account also reported that in the morning came the alert that the "enemy had broken though into our trenches. Our infantry then counterattacked" supported by German artillery fire. According to www.anzacsinfrance.com: "The battle had lasted 10 hours, with shooting ceasing at about 2 pm. The 4th Brigade took 3,000 men into battle and sustained causalities of 2,339. The 12th Brigade took 2,000 into battle and lost 950. Part of these casualties included 28 officers and 1,142 men captured, by far the most prisoners taken in a single battle during the whole war. The reason for this was the fact that the attack by the Australian 4th Division had actually breeched the Hindenburg line but been left isolated and unsupported by inadequate artillery fire." 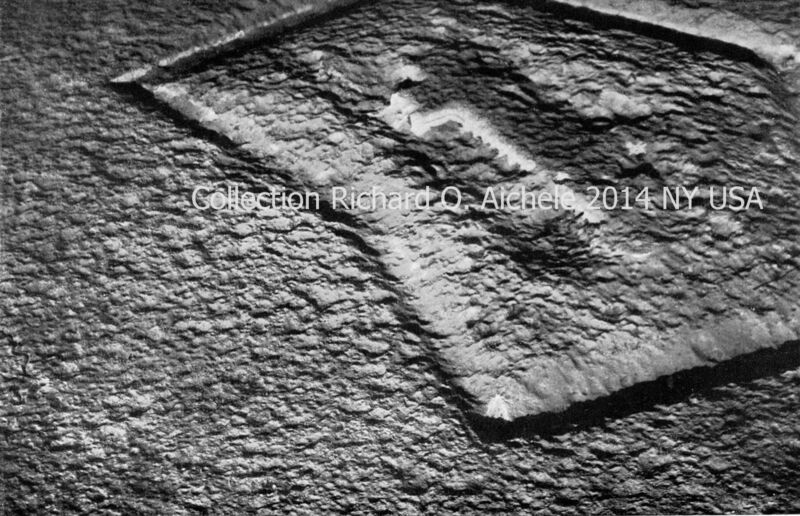 Click for the story of one German soldier at Arras. "At 2:30 in the morning of October 4, the regiment was awakened to advance toward Nantillois, and when they were about to leave it was learned that the artillery was going to put over a barrage to assist the advancing "doughboys." After this was over, the regiment moved forward, some of the companies without any breakfast. It developed that the infantry did not advance as far as expected but had encountered very determined resistance. 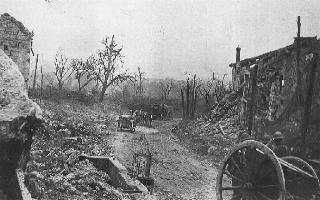 Also the shelling of the roads north of Montfaucon was very severe, and the town of Nantillois, through which the "doughboys" had passed was peppered off and on frequently during the day. Therefore, the First Battalion which was in the rear of the column returned to Montfaucon shortly before noon. The Second Battalion, however, continued the advance moving very cautiously and slowly on account of the heavy shelling. A picked squad of Co. "D" under Lieut. Covell, reconnoitered the Cierges-Nantillois road as far as Nantillois. The battalion was held up just south of the town all the forenoon, as all manner of projectiles were being rained down into the valley." ""During the morning, regimental headquarters at Fresnes were blown up, Lieutenant Colonel Fetzer and several orderlies being killed. 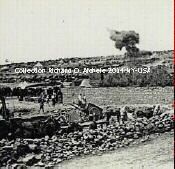 During the afternoon, the Second Battalion joined the Third at the foot of the hill north of the river, and on the morning of the next day the Third stormed Hill 230 but was held up by heavy artillery and machine gun fire. At the same time the Second Batallion moved toward Grimpettes Woods, with Companies E and G leading. While the edge of the woods was reached, the casualties were so heavy crossing the open stretch in full view of the enemy, that it was necessary for the survivors to fall back to their original positions. Companies E, G, I and K suffered severe casualties in the first part of this attack. Those of K were the most severe, the ranks of that company raked by deadly machine gun fire as they stormed the slope and forty-one men were killed. Campany E penetrated the woods the farthest before the ridge was finally carried." 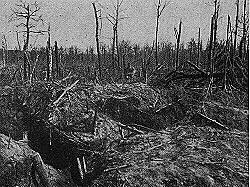 During the day of October 2nd, Company A was badly cut up while taking a small hill, and during the attack we lost 90 men in less than 30 minutes fighting. About 40 members of the company were sent back by Major Whittlesey to establish posts of communications and to act as stretcher bearers, as men were being wounded faster than they could be handled. Eighteen of the company remained with the Major and were caught in the second trap. We fought desperately during those six days going "over the Top' as often as three times in one day. That you may have some idea of the cost of the ground taken in those Argonne Woods, can give you the facts of my own company of which I have an intimate knowledge. We went Over the Top on September 26th with 250 men and on the night of October 15 there were only 44 of us followed Major Whittlesey out of the front lines to the second lines of support near Grand Pre." "I was afraid to move for fear the Germans would start their murderous fire again but just about that time a German appeared from behind a bush not six feet from me and held a long Luger revolver leveled at my head. It is an actual fact that the barrel of it looked to me at that time as large as a shot gun. The German stepped over to me and started talking in his own language and pointed at my leg. I half turned and looked to where he was pointing and saw blood spurting out from my leg near the knee. For the first time I realized I had been hit. Then other Germans appeared and began looking at my comrades and then I knew how they had fared. Of my seven Buddies I found four had been killed outright and all the rest wounded. Our Indian guide was one of those who had been killed. My three comrades were more seriously injured than I and the same German who captured me put my arm around his shoulder and I half hobbled and was half carried over to where the machine gun sat which had played such havoc with us. The other Germans carried my comrades over...By this time a German Runner returned and motioned for me to get up and started walking back through the forest with me, while other Germans carried my three comrades on improvised stretchers. After we had gone a short distance I was turned over to another guide and a little further on was another, and in this way I was relayed back to German headquarters." "The 153rd Brigade was awarded a commendation by Major-General Robert Alexander, commanding the 77th Divison, for the capture of St. Juvin on October 14, 1918, "after a difficult night march the attack was made and the objective set for the day's effort successfully reach. In the course of the operations a large number of prisoners, including officers of superior rank, were taken by the 153rd Brigade." The Divsion History noted, "The enemy had not yielded St. Juvin, however. On the night of the 14th, no less than six barrages were poured into St. Juvin and the valley south of the village and continuous harassing fire of artillery, trench mortars and machine guns swept the positions of our troops in the vicinity of the town. A great deal of the enemy's fire fell on our rear lines and caught the divisional reserve in the valley at La Besogne, inflicting twenty-five casualties among the machine gunners of the divisional machine-gun battalion, held in reserve at that point. In the morning over came a counter attack. A severe fight ensued but St. Juvin stayed in our hands. The 308th threw one battalion across the Aire to the east of Grand-Pre, with its right resting at La Kairesse and its left at Chevieres. The mission of this force was to move by the left and cut the enemy's communications in the east. Meanwhile the main attack against Grand-Pre was preparing." by Colonel J. F. Barber, 304th Engineers, 79th Division, USA. American troops entering the former German stronghold of Montfaucon. "That night a platoon of Co. E was ordered to move ahead to remove a wrecked tank that was obstructing the road north of Montfaucon. This tank had been disabled in the middle of the road, and could not be operated. It had to be dragged, persuaded, or in some way cajoled by boards, levers and what-not into an inoffensive place off the road. The work on it had to be performed in the dark as quietly as possible, as it was exposed to enemy fire and quite near the front lines. The first night the platoon moved it a little bit, before the enemy was aroused and prohibited further activity with his "whiz-bangs." The next night is was moved a little more when the "G.I. cans" came hurtling through the air The following morning when the regiment advanced toward Nantillois, another platoon of Co. E removed it altogether." On the night of September 3, orders came that the division would cross the Vesle the afternoon of the next day. 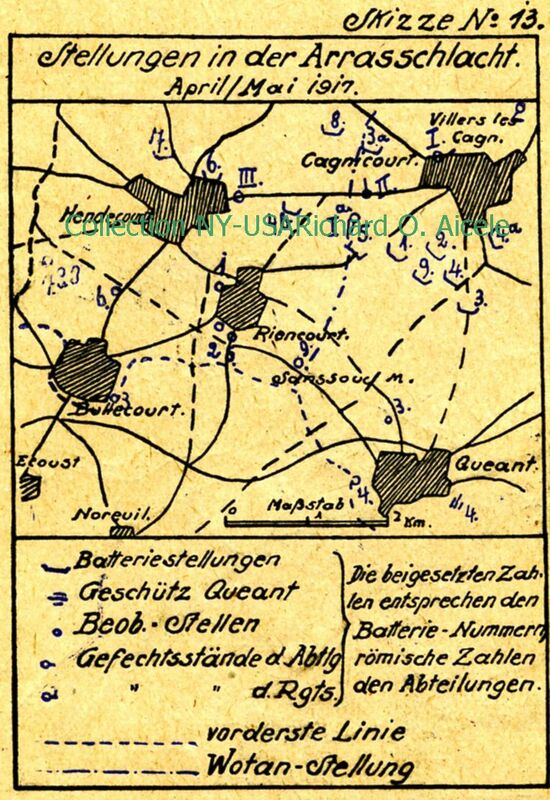 There was considerable changing of battery positions during the night, moving close to the front line and the detailing of two battalions of light artillery to cross the Vesle with the advance infantry. The attack was started earlier than expected . On the night of September 5, the infantry reached the heights of the Vesle River and the artillery succeded in crossing the river the same evening. The 107th crossed the Villette and the 100th at Courlandon. 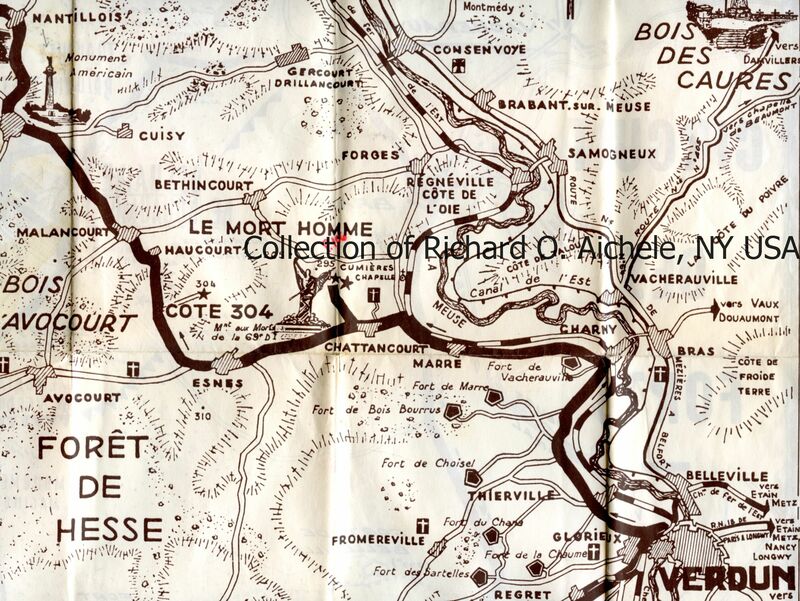 One battalion of each of the light regiments and the 108th remained on the south side of the Vesle River to protect the advance of the infantry units The brigade and division headquarters were moved to Mont-sur-Courville on September 5. On the morning of the next day the brigade put down a heavy barrage fire which continued from 11 a.m. to 1 p.m. This drew a severe counter-barrage fire from the Germans. The Crown Prince's Observation Post After Capture by the U.S. 79th Division. "The Crown Prince is reputed to have used this place in Montfaucon as his headquarters during the battles of Verdun. The Germans built it with characteristic thoroughness which could survive any ordinary bombardment. In fact, it has survived both our own and German fire during the September 1918 drive to the Argonne. The chateau is a 3 story barn shaped building, constructed with the massive outside and inside masonary walls, common to the older French architecture. The Germans have first laid a heavy course of reinforcing over the first floor, making the arched cellars excellent shelters with from 6 to 10 feet of masony and a 30 inch stone cover. In addition a dugout was built under the road providing an additional 18 feet of cover. From the basement is built a tower reaching to a total height of 35 feet. This tower is well protected, having for the most of its height three feet of concrete and two masonary walls on the side toward the enemy line. A 4 foot slab covered the top. A small chart room at the highest point sheltered the observer and his instruments." "The special feature of the place was a powerful, reflecting telescopic periscope mounted on a gun carriage and put in place on the first floor with the tube running through the tower and out the roof. This instrument was so constructed that observation could be carried either through selective eye pieces at the base of the tube on the first floor, or by means of reflectors and prisms from the second or third floors. A large and very elaborate observation map was found mounted in the chart room scaled in mils and orientated with respect to the instrument, so that to lay on any point on the map it was only necessary to get its mils defelection from the map, turn it off on the traversing scale of the telescope and bring it into focus from the eye piece. The instrument was captured in servicable condition, but before it could be brought to bear on the enemy lines, some thoughtless souvenier hunter stole the eye pieces rendering it useless."